Cody Willoughby | Miami Valley Today A team of walkers march north from Troy Memorial Stadium at the opening of the 23rd annual Walk MS event on Sunday. TROY — Residents of Miami County banded together toward a cure for multiple sclerosis during Sunday’s 23rd annual Walk MS Troy event, held at Troy Memorial Stadium. Approximately 225 pre-registered for the event, with hundreds more registering the day of the walk. Registrants had the option of checking in as individuals or as teams. The walk, which consisted of a one-mile and three-mile course, took participants away from the stadium toward Adams Street, along Riverside Cemetery, and into Duke Park. A free lunch was provided to participants at the stadium following the walk. While registration was free, participant donations were accepted. Event t-shirts were provided to those who donated $100 or more, with award levels for various other prizes. Veach explained that all resources for the event were provided by the generosity of local sponsors. “That allows us to not spend any money, but also have all of our funds go toward research, programming, clinics, and putting on special events,” Veach said. In 2018, Walk MS events nationwide topped the $1 billion mark in raising money toward research. Other upcoming local Walk MS events include a walk in Sidney on Saturday, April 13 at 2 p.m., which starts and ends in Tarawa Park, and a walk in Kettering on Saturday, May 4 at 10 a.m., which starts and ends at Delco Park. Registration for both walks will be open 90 minutes prior. 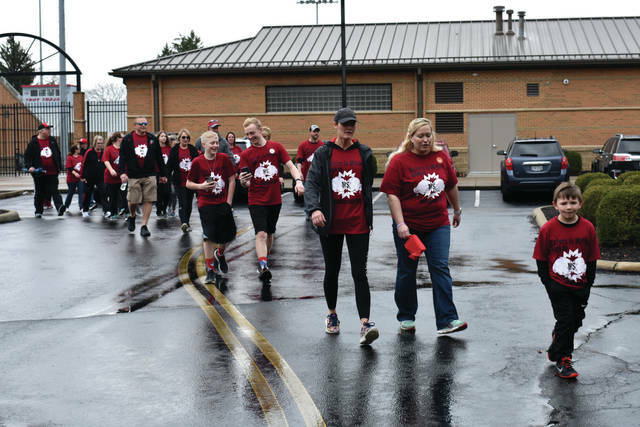 https://www.tdn-net.com/wp-content/uploads/sites/21/2019/04/web1_WalkMS1.jpgCody Willoughby | Miami Valley Today A team of walkers march north from Troy Memorial Stadium at the opening of the 23rd annual Walk MS event on Sunday.